We’ve been on a Thai kick for, oh, the last 6 years or so. Clearly, our affection for this cuisine is not going anywhere. Our recent go-to has been Mango Curry and spring rolls of some kind. My favorite is the light and fresh “salad” rolls with crunchy vegetables and tofu. This is my adaptation of that with a garlic cashew dipping sauce (oh hello, gorgeous) and my favorite vegetables at the moment. Do you want to know the secret ingredient that makes these Thai Spring Rolls the best you’ll ever try? Fresh basil. Fresh basil in spring rolls is something like magic. And when paired with tofu, crispy vegetables, and a savory-sweet dipping sauce, it’s all too much for my taste buds to handle. OK, clearly not, but it’s that good. Not only in this recipe delicious, it comes together in about 30 minutes! I think we can all spare 30 minutes for a delicious meal or snack, eh? 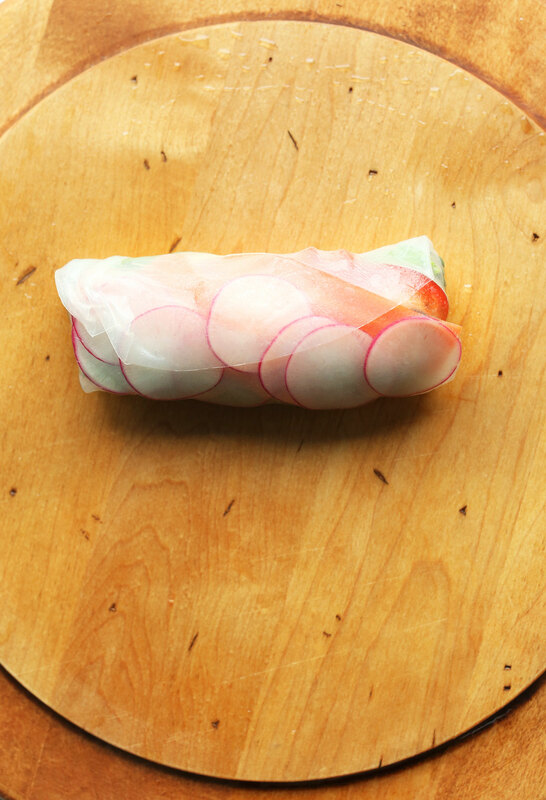 The idea for adding radishes to the bottom of the rolls (so gorgeous! ), came from Nutrition Stripped (genius!) If you haven’t tried that lady’s golden turmeric milk, by the way, you haven’t lived. Go do so now, please. It would make the perfect accompaniment to these rolls. 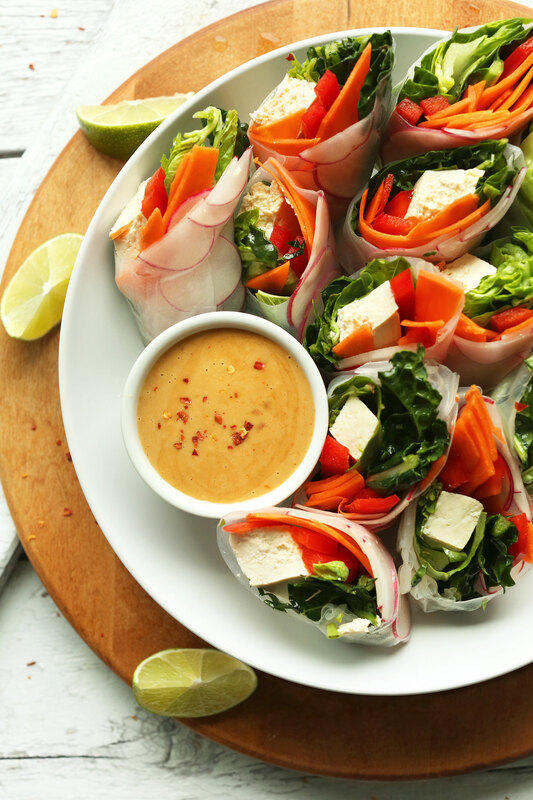 Make these spring rolls to serve alongside your favorite Thai entrées (like my Yellow Mango Curry or Creamy Thai Carrot Soup), or enjoy as a main dish! With the tofu and dipping sauce, they’re incredibly satisfying, and the veggies will leave you full for hours. If you try this recipe, let us know! Leave a comment, rate it, and don’t forget to take a picture and tag it #minimalistbaker on Instagram so we can see! Your photos always make our day. Cheers, friends! 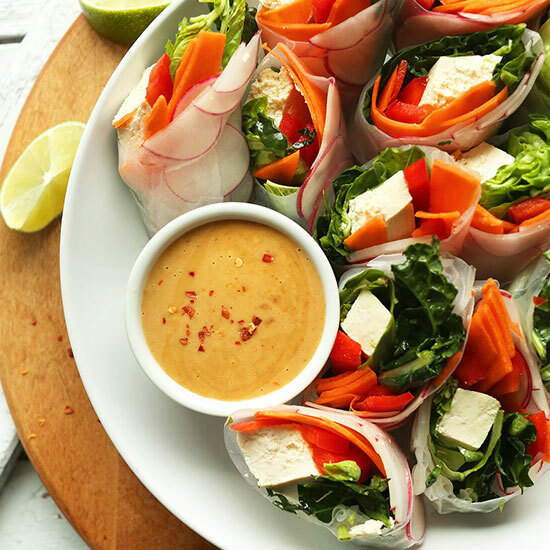 30-minute Thai Spring Rolls with fresh veggies, basil, and tofu, served with a savory-sweet cashew sauce. A hearty plant-based entrée or side! Wrap tofu in a clean, absorbent towel and set something slightly heavy on top - such as a saucepan - to begin "pressing" and drawing out excess moisture. In the meantime, prepare sauce by adding minced garlic, cashew butter, tamari, maple syrup, lime juice, and red pepper flake to a small mixing bowl and whisking to combine. Add hot water until you've reached a semi-thick sauce consistency. Taste and adjust flavor as needed, adding more lime juice for acidity, red pepper flake for heat, tamari for saltiness, or maple syrup for sweetness. Set aside. Add clean, dry kale to a medium mixing bowl and top with sesame oil and tamari. Massage with hands to soften and infuse some flavor. This step is optional, but results in a more flavorful roll in my opinion. Prep remaining vegetables and cut tofu into rectangular strips (see photo). Arrange on a platter so they're easy to access. Also ready a cutting board by slightly dampening its surface - this is where you'll prepare your spring rolls. Pour very hot water into a wide shallow dish (I use a skillet) and let cool slightly. Then dip one spring roll wrapper in the water and let it soften for 10-12 seconds, until just pliable. If you let it set too long, the paper will get too sticky to work with. Use your hands to gently spread the wrapper onto your dampened work surface, making sure there aren't many creases. Then top with fillings in this order: radish, bell pepper, carrot, tofu, basil, kale. Fold the bottom of the wrapper over the fillings, firmly tucking them into each other, then fold the sides over the center, and continue rolling until the spring roll is seam side down. Place seam side down on a serving platter and set aside. Continue until all fillings are used up. Serve with cashew dipping sauce. Best when fresh, though leftovers will keep stored separately for 2-3 days. *Nutrition information is a rough estimate calculated with dipping sauce. Could this be made with macadamians ? Hi! I would recommend sticking to cashew butter! I can’t have cashews. Oh well. These are delicious!! I have laso aded fresh cucumber to the mix and they are just divine! I’ve used bigger sheets and after having 2 big rolls i was stuffed!! As i am not vegan i used honey insted of maple syrup. Goes very nicely together as the sauce ingridient! This is what is going ti help me with the long Winter season ahead! Tastes and looks like Dpring on the plate! LOVE IT!! ❤️?❤️? My daughter and I made tje dipping sauce and used it on roasted vegetables. It was yummy. was just wondering about the availability of organic rice wraps. I try my darnedest to eat only organic fruits and vegetables, and am successful there, but I hate the idea of pesticide-ridden rice. Doesn’t make sense to me. Wow!! The cashew dipping sauce is SO savoury! My guests and husband loved this combination. I definitely recommend this recipe! OMG that dipping sauce is amazing!!!! I also made it with pumpkin seeds for a nut-allergic friend and it still turned out pretty tasty. Thanks! I made this today, they are amazing!!! Basil! Boom! Drops mic. Thank you for this recipe! I had most of the ingredients except I didn’t feel like buying cashew butter, but used Sunbutter and the taste was amazing! I will be making these again. Made these last night. I put avocado, mushroom, garlic sprouts, basil, smoked sriracha tofu, cucumber, and orange pepper. The sauce was amazing. Thank you. I’m on a 21-day vegan food plan for health reasons (I don’t like vegetables and am a carb, dairy and meat eater) – and I can’t eat salt so, not a happy camper. Your site actually makes me WANT to try your recipes! I made this for breakfast (why not?!) and used whatever veggies I had in the fridge… I had no cashew butter so I used almond and WOW! That sauce made all the difference. I’m very impressed. I shall try more! Hi! I was looking for a special dish for Passover when I stumbled across this one. It was definitely the star of the show! Even my non-vegan father raved about it,it was that delicious. Thank you so much! 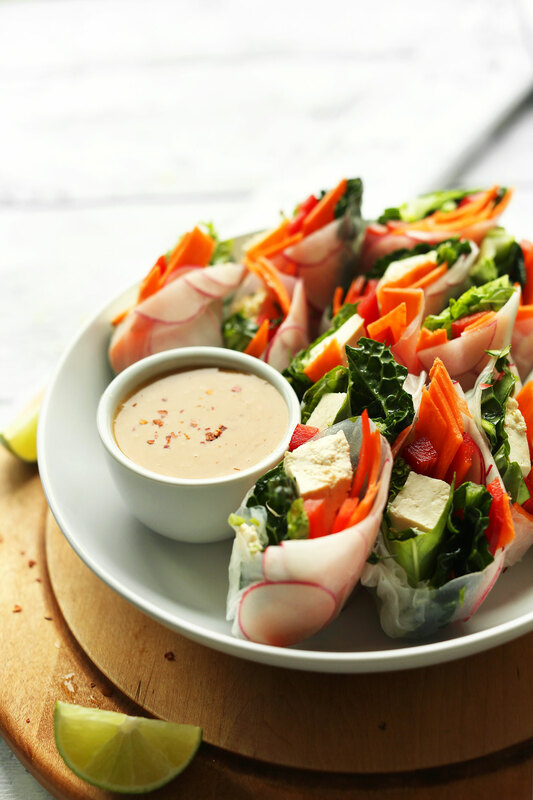 My daughter is on a spring roll kick, she makes an amazing peanut dipping sauce. I can’t wait to show her this recipe! Where do you purchase your spring rolls? I’ve been trying to find them for like a year with no luck!!! This is a really fun and fresh Spring version!! Love the sauce too! I’ve been on a Thai kick for FOREVERRRRRR! It’s so so good! Anyways, do you have any tips on how NOT to rip the rice paper in half? It’s kind of why I stopped buying them because every time I wanted to make a spring roll they would just fall apart! Thank for the tips, Willow! I roll it on damp kitchen roll or a damp J cloth with edge tucked under chopping board to keep it from moving. Yum! Yes please! I agree, the radishes look beautiful in the bottom of the roll. This looks easy and delicious. Question–for the kale, do you mean massage it with toasted sesame oil or regular sesame oil? I’m guessing the former, yes? I’m also on a Thai kick! I am going to plan this for next week’s menu! I’ll be back to rate it then :) Thanks for sharing! I am drooling a little right now just at the thought of it all. Looks yum ! will try this tonight, Can I find the rice roll paper in trader joes or whole foods ? May I know what brand can I buy from these two stores. Whole FOods for sure. I usually get mine at World Market, super cheap! This truly makes you feel like spring. Light, color, nutrients and vibrancy! That cashew sauce sound delicious. I am a sucker for anything cashew! I love this! Although I’m not the biggest fan of bell pepper..Any ideas for veggies to sub for the bell pepper? Sidenote (but kind of related): Any ideas for vegan pizza, maybe thai inspired? I’m thinking in the direction of BBQ chicken pizza (mostly for the cilantro). These look way to good to be true! 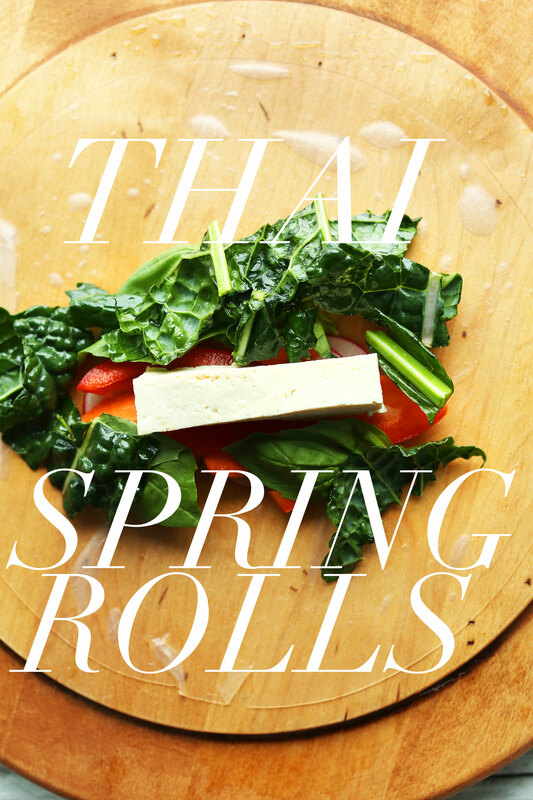 I’ve always wanted to make my own spring rolls but thought it would be too complicated. You make it look easy! This is so pretty! I can’t wait to make it. 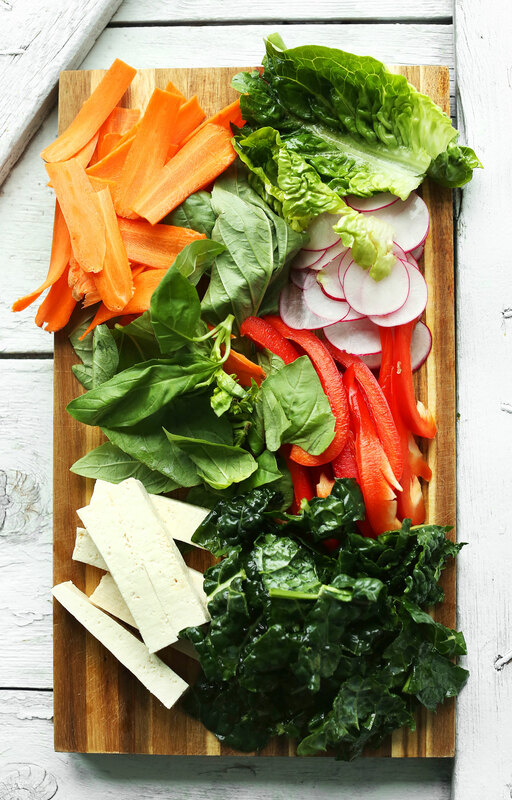 It’s like eating the rainbow, pretty food that makes you pretty from the inside-out. I would also make a salad using these ingredients. Would be great with glass noodles! I love food that looks so colourful! You just want to take 100 pictures first before you can dive in. That dipping sauce sounds yummm too! Agreed! And it makes me feel slim and trim. Even though all the chocolate I eat doesn’t help with the slim and trim bit. I remember a couple of months ago you did a spring roll recipe and it was my first (and very good experience) with spring rolls. However, you were holding back on me with this cashew dipping sauce. Yummy yum yum in my tummy tum tum.